This entry was posted in Christmas, Cookies, Dairy-free, Desserts, Easter, Thanksgiving. Bookmark the permalink. They look delicious. I love pine nuts. One day I’m going to have to pick up some almond paste … or make my own. 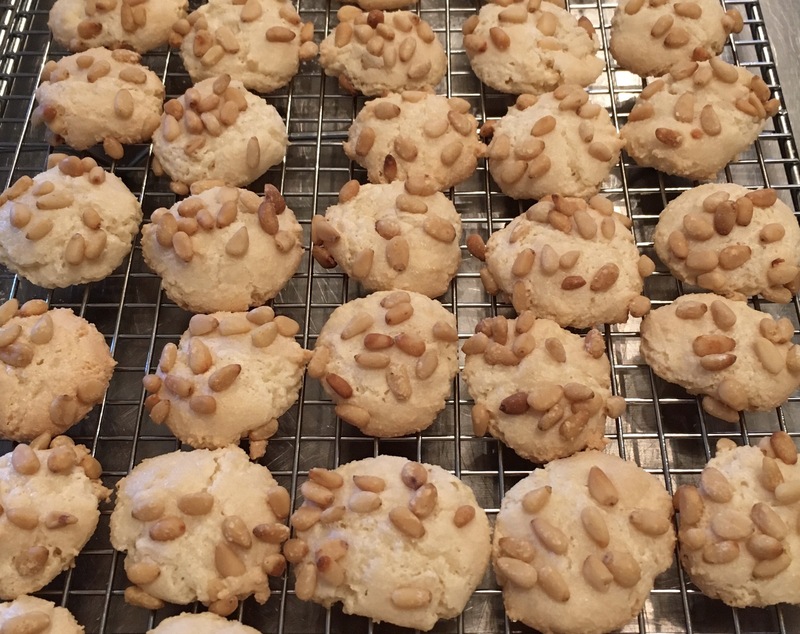 I used pine nuts from Trader Joe’s and Solo brand almond paste. By using a food processor, it only takes a few minutes to put the dough together. I hope you like them when you have the chance to make them. I only cook for myself so I have to restrain myself. I bought a jar of mincemeat and am debating among mini mincemeat pies and no churn mincemeat ice cream as well as the thousand and one other possible Xmas desserts that I run across daily on FB and the blogs I’m subscribed to. The poppyseed rolls I made last weekend (and posted) were a lot of fun … I gave away one of the loaves and am making my way through the 2nd quickly. And then there are the jam cookies (Hungarian lekvaros papucs or baratfule) I’m thinking of making.